Old meets new. That’s OFS. The shiny and modern industrial feel inside of 333 Park St. today, stands on the foundation of a generations-old family presence in the fabric industry. In some ways, we’re a miscellaneous bunch—a fusion of warehouse, customer service and web. Yet we’re aligned in getting something as timeless and tactile as fabric into your hands in ways it has never been done before. Some of us fresh on the scene, some seasoned as can be. Harley riders and Brooks Brothers aficionados. Talented techies with artists and craftsmen. This blog is our way of revealing the offline OFS. What’s behind our products. What goes on here in our West Springfield, Massachusetts headquarters, just off of the Connecticut River. Sometimes perhaps we’ll even go beyond the expanse of these walls. And while each post and photo we offer up will give you a peek inside of our “culture,” it’s simultaneously giving us a chance to identify and define just what that OFS culture is and means. So please, dig in. And more importantly, take part! Whether in the comments right here on the blog, or on our Facebook Wall, Twitter or Google+ page! We want to hear what you have to say. What you’re inspired by. What you’re making. I have a question relating to Spandex! I’m new to sewing with spandex, and I have to make a sports wear for some one. The question I have is how much extra to give (if any at all) when cutting the pattern? For example; Her bust measurement is 34 inches, Usually you cut extra for sewing allowance, but Im not sure if I still do that or cut it exactly for 34 since I’m working with Spandex? Apologies for missing this comment Martha. Is there anything we can still help with? I’m new to your site but I’m so impressed with the variety! I have a question. What is “crocking”? I’ve seen a warning on some fabric bolts (particularly ones for upholstering) that say “May crock”, but no one, including the fabric store employees, can tell me what that means. Any help? That’s a great question Bonnie (and welcome to OFS!) Crocking is essentially when any extra dye on a fabric rubs off onto something else. You can help reduce this by washing the fabric with a color catcher http://www.shoutitout.com/en-US/Products/Pages/shout-color-catcher.aspx Hope this helps! Just so you know, I have subscribed to your emails – I mean to this website. But in today’s email with subject “[New post] Craft Room Before & After” there are two links which has wrong url. The url contains and extra “http” at the end of the link. So incorrect link has been send to all subscribers. I just though to inform you. So sorry about that Nikey and I appreciate you letting me know!! 🙂 Will look into it and fix! Please, do you have an spanish versión ? I’m sorry, Maria. We do not have a spanish version. Made this for a little bathroom privacy…how did the recent “open concept” plan for the main living area spread to the master bed&bath? Anyway, the curtain is beautiful! I’d love to show y’all, but I don’t see a place to submit pictures. Hi bedmel, We’d love to see your photos! 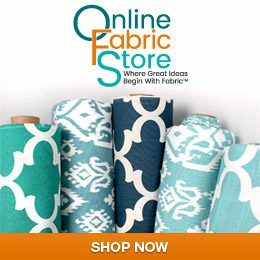 Unfortunately we don’t have a way to submit them through this blog, but you can email them to media@onlinefabricstore.net and I’ll take a look. I know, soon the entire house will be open concept! I (at long last) got your comment. Will send a photo to the email you provided; please let me know what you think! I’d love to know the opinion of someone who doesn’t (or shouldn’t) feel *obligated* to tell me how great it looks!